If you have oily and acne prone skin that you just cannot seem to control, you should check out these candidates for the Best Face Wash For Pimples And Oily Skin For Man. These guys are well known for their awesome men’s facial and beard products, and they have not failed to deliver here. Rocky Mountain Barber Company Face Wash is SLS and paraben free, made with natural ingredients, and features aloe, jojoba, and argan oil. These ingredients work together to help unclog pores and wash them out, thus getting rid of dirt, debris, and oils. This also helps to kill and wash away bacteria which can clog pores, cause pimples, and make skin oily. Simply wash your face with it twice per day for the best results. The chamomile in this product helps to bring some hydration to the mix, while also helping to lock moisture in. It is a good option for irritated skin. For one, we like how Rocky Mountain Barber Company Face Wash is all natural and chemical free. Second, instead of drying your skin out, it actually moisturizes it, but it also makes it less oily. It’s a great option for washing out clogged pores, plus it is not all that expensive. The only bad thing that we have to say about Rocky Mountain Barber Company Face Wash is that the scent of it is not exactly pleasant, but to improve the smell, you would have to add other ingredients or chemicals, which could defeat the purpose of supplying a natural product. Brickell is quite a trusted brand name when it comes to men’s care products and have certainly delivered a quality product in this face wash.
Brickell Men’s Purifying Charcoal Face Wash contains jojoba oil, which is great for hydrating your skin and for preventing future dry skin. It also contains aloe, which is fantastic for providing your skin with moisture and antioxidants, thus strengthening the skin, cleaning it, and making it healthier. It also contains olive oil, which helps to displace and remove dirt, other oils and bacteria, and also helps to nourish the skin. The addition ofcharcoal helps to kill and remove bacteria and other unwanted substances, thus killing off and preventing future acne outbreaks. This is a great all-natural option to go with for oily and sensitive skin. We like how Brickell Men’s Purifying Charcoal Face Wash is all natural, how it works well for sensitive skin, and how it comes with many ingredients that work to remove oils, dirt, bacteria, and prevent acne from occurring. Also, the price of this stuff is pretty decent too. One of the only bad things about Brickell Men’s Purifying Charcoal Face Wash is that it does not lather, so you need quite a bit for each wash, which actually makes it less cost effective than it might seem at first. Also, the smell is not all that enjoyable. This is a fairly high-end option, one that works really well, but also costs a fair bit. RUGGED & DAPPER Facial Cleanser is made with prime natural ingredients such as aloe vera, vitamin C, willow bark, and burdock root. These ingredients work together to exfoliate the skin, thus removing built-up oils, dirt, grime, and bacteria. It is great for killing and preventing acne outbreaks. Also, it does a pretty good job at hydrating skin and relieving irritation too, but for some people, the ingredients may actually cause dryness. We like how the ingredients are natural, how the product smells fairly good, and how it does a fantastic job at nourishing the skin and getting rid of oils and acne. The price aside, it actually might dry your skin out depending on the type of skin you have. 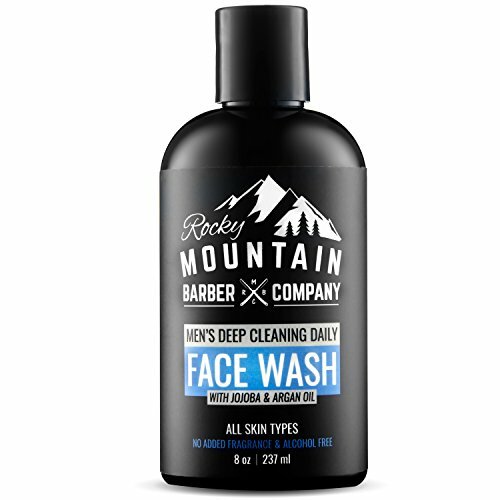 In terms of hydration, acne killing, nourishment, and overall effectiveness, we have to recommend the Rocky Mountain Barber Company Face Wash as our No. 1 choice. However, Brickell Men’s Purifying Charcoal Face Wash is also quite effective.